If You Scrape the Mold off Your Food and Eat It, Is It Really That Bad? When you go to make yourself a sandwich and see a bit of mold growing on the side of the bread, you may be tempted to cut it off, and then it would be perfectly safe to eat, right? After all, food waste and consumption is a serious concern, and British Prime Minister Theresa May has even stated that when her jam gets moldy, she simply scraps it off and eats what’s underneath. When it comes to mold on food, there is a bit of debate about what you should and should not do. According to Healthline, while some mold is safe to consume (think blue cheese, for example), other molds are not, and the publication recommends throwing away bread with mold because not only can it have a strange taste, it could also present health problems. We cannot know what mold is on the food, simply by looking at it, so to be safe, it’s best to assume that it cannot be eaten -- also avoid sniffing it, as the inhaling the spores may cause an allergic reaction in some individuals. Mold spores can spread to parts of the food which you cannot see. And The Food Safety and Inspection Service of the United States Department of Agriculture (USDA) informs individuals to discard the entire loaf of bread if some of it is contaminated. But that doesn’t mean that every single item with a few spots of mold needs to be thrown away, and according to The Independent, some foods with mold are safe to consume. Hard salami and dry-cured hams stored at room temperature sometimes have mold growing on the surface, which is safe to scrape away. Hard cheeses like parmesan are also unlikely to have mold penetrate beneath the surface, but one inch around the mold should be cut off before consumption. The publication also notes that the knife should not come into contact with the mold, and after removing the mold, the cheese should be wrapped in new plastic. And firm produce such as carrots, bell peppers, and cabbage can also be consumed if there is mold on the surface. The food needs to be hard and have a low water content, and the mold, along with 1 centimeter of the surrounding food, should be cut off with a knife. 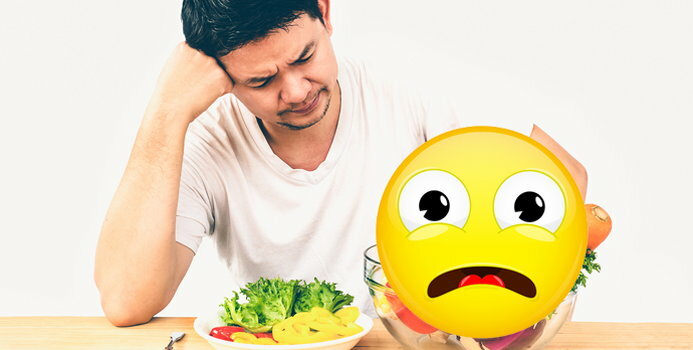 On the other end of the scale, ABC.Net notes that foods to avoid completely if they have mold include luncheon meat, bacon, and hot dogs, soft fruits and vegetables, bread and other baked goods, peanut butter, nuts and legumes, jams and jellies, and yogurt and soft cheese. Also, try to use common sense when determining what food can be salvaged and what cannot. "We advise not to eat food that is obviously rotten or containing mold due to potential risks from the mold," The Food Standards Authority (FSA) says. Extra precaution should be taken for individuals who are pregnant, children, elderly, or have a weakened immune system. There is also no guarantee that cutting out the mold and the surrounding areas removes all the unseen toxins.